Wow! Once again I am thoroughly impressed with the skills and determination in contestants quest to find the longest word. Congratulations to all the winners. Make sure to play the new Word Watch Contest. 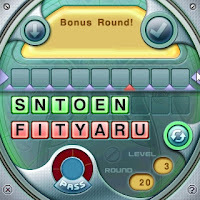 To the left is a screen shot of Word Watch, our unscramble timed word game. Create the longest word you can using as many green and red tiles. However, the word must contain at least one red tile. The longest word with the most red tiles wins. All great ideas come from the same wellspring, the human brain, and some are often quite similar. Many of you have compared our game Farkle Dice to Yahtzee. And yet, they certainly aren’t the same game! So what do you as players think about this? Is Yahtzee the original and the best, or does Farkle Dice more or less represent the bettering of the best? We’d like to set 1956 up against 2007. We’ve opened a forum on this subject, and would like to reward the first posting with a free copy of WordPop, Word Monaco Solitaire, Farkle Dice, Word Watch or Triples. In addition to that, we’ll randomly select 2 more postings to receive a free game as well. Contest closes 3/25/07. Winners will be notified by e-mail and / or in the next newsletter. We were amazed at some of the words found and the enthusiastic responses from the last contest. See the next posting for our latest contest. Congratulations to all the winners from the February 5 Word Monaco Solitaire Contest. co2stay, dcroennau, qc832, LKeeton, and bearboy. Marie, contestr, usuallyfrazzled, bkauntie64, and Barksfan.